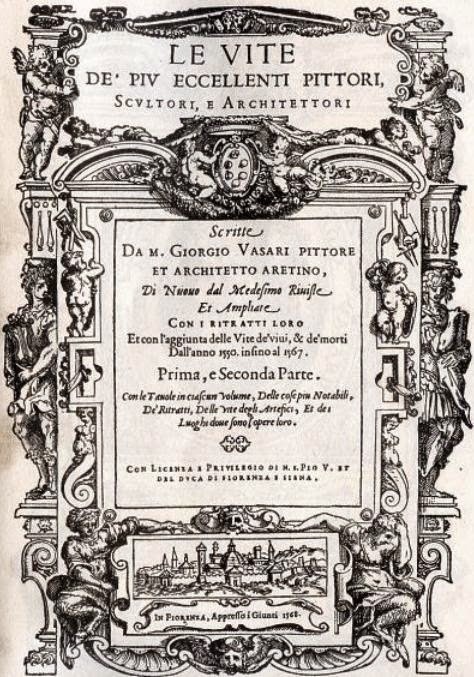 The ten volumes of this book were written in roughly the year 1568, during the Italian Renaissance, by an Italian artist about Italian artists. The books contain biographies and descriptions of the artists' major works, ordered by style, which is not exactly chronological. The biographies are written in a gossipy, first-hand style, that revels in namedropping, making the books a Who's Who of the Italian Renaissance (the Name Indices at the back of each book are an amazing collection of Renaissance artists!). ...writing down the lives, the works, the manners, and the circumstances of all those who, finding the arts already dead, first revived them, then step by step nourished and adorned them, and finally brought them to that height of beauty and majesty whereon they stand at the present day. Look closely at the beginning of the books and you will see the Papal permission (Pius V) for publication that was required for all books a the time, and were issued by the Offiicii sanctissimae Inquisitionis Florentinae, the same office of the inquisition who refused publication rights to Galileo's writings and had him jailed. The books are all AVAILABLE FOR FREE download as e-books, in various formats, from Project Gutenberg, the grand-daddy of free e-book sites on the Internet. The edition at Project Gutenberg is the 1912-1914 edition published by MacMillan and Co. Ltd. 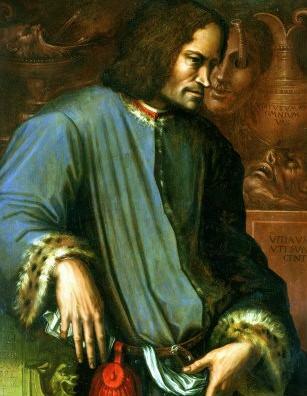 Together with The Medici Society, and it is a translation from the Tuscan to English by Gaston Du C. De Vere. Hundreds of photographs accompany the text. Project Gutenberg was the first group to put public domain texts online for free download. Others have taken their free texts and packaged them as to-purchase books. Don't be fooled! They are all free via Project Gutenberg in various e-book formats, and many are available for free via Amazon.com as Kindle e-books. Giorgio Vasari was an artist, and in the Florentine tradition, also an architect, but he modestly calls himself "a painter of Arezzo". He lived from 1511 to 1574. Most of his commissions were for the Ducal family of Florence, the de' Medici, to whom he dedicates the biographies. Reading the biographies, you will notice that most commissions for art and buildings came from the Catholic Church, royal families, and wealthy aristocrats. Most tourists who have visited Florence will recognize Vasari's name as linked to the corridor that connects the old government buildings in the center of Florence, to the Pitti Palace, the last de' Medici palace on the opposite side of the Arno River. 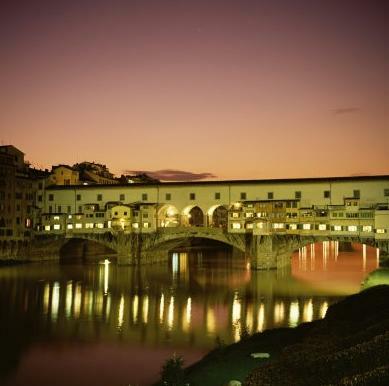 The corridor, designed by Vasari, runs above the shops on Florence's famous Ponte Vecchio. Actually, the corridor and bridge are the backdrop to this blog. This view of the Ponte Vecchio gives the best view of Vasari's corridor above the shops. 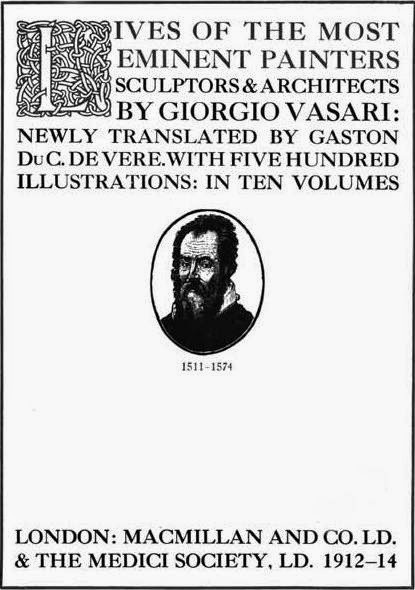 Vasari describes its construction in Book 10. The sections that will most interest the casual reader are those about the two most famous artists of the Italian Renaissance: Leonardo da Vinci and Michelangnolo (that is the Florentine spelling and how the man spelled his own name) Buonarotti. 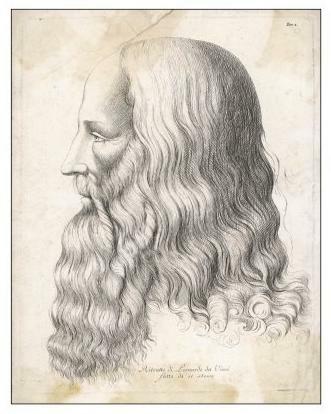 The biography of Leonardo da Vinci is in Book 4, and it is a very long section, praising the artist as a man and as a scientist and an artist. "...in supernatural fashion, beauty, grace, and talent are united beyond measure in one single person." "...to whatever difficulties he turned his mind, he solved them with ease." 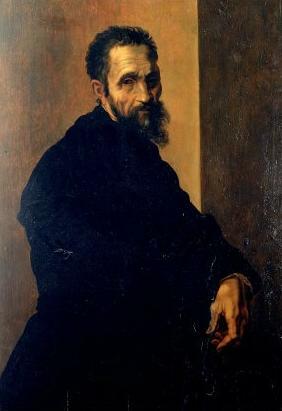 The biography of Michelangelo is in Book 9, and it is wonderfully gossipy, full of first-hand accounts of the man, who was a friend of Vasari's, and peppered with quotes from private letters of Michelangelo's. What comes across strongly is the reverence that the de' Medici showed Michelangelo, a longtime friend of the family, and the artist they trusted to make the family tomb in the Church of San Lorenzo in Florence. "I shall never be weary of confessing the obligation that I feel towards that lord [ed. Cosimo de' Medici] for so many marks of affection." 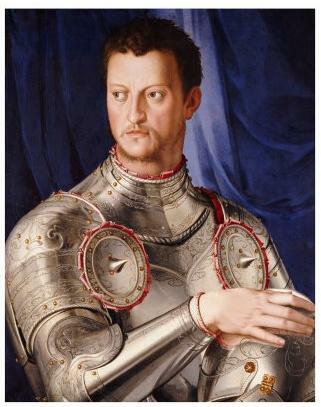 A portrait of the first Duke of Tuscany, Cosimo de' Medici, in his full battle armor, painted by the official de' Medici portrait artist, Bronzino, who is described in Book 10. Includes the descriptions of Bronzino's portraits of the Ducal family, and of the wedding festival for Francesco, Duke Cosimo de' Medici's eldest son and heir, and projects Vasari undertook for the royal family. Would you like a private tour of Vasari's corridor? Here is one, that includes at the end a bit of the Boboli Gardens and some of Michelangelo's designs at the Church of San Lorenzo.